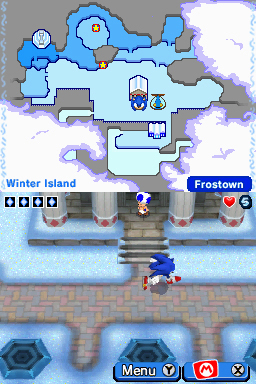 Frostown is a town found in Mario & Sonic at the Olympic Winter Games for the Nintendo DS, and home of Frosty. It is the first area in Adventure Tours and features a Gallery, a totem of emblems, a broken mechanism and a Thwomp. Toad is the first character Mario and Sonic the Hedgehog encounter in Frostown. Sparky is held hostage by Eggman Nega here. Frostown got its name for its year-round cool weather, perfect for winter sports. Toad has different-colored friends, and they usually live in the Mushroom Kingdom. If you do especially well on a mission, you might get extra challenge attempts. Shy Guys all wear masks, so no one knows what their faces look like. Bowser Jr. wears a mask around his neck that also doubles as a bib. Frostown is cool even in the summertime. Tails' real name is Miles Prower. No one knows whether Sonic thinks of Amy as his girlfriend. Chao can only talk in their own Chao language. This page was last edited on January 8, 2018, at 16:13.